Samford University’s opening convocation of the fall semester on Aug. 18 saluted student leaders, longtime donors and employees John Petrella and Glenda Martin, who received faculty and staff excellence awards, respectively. In his address, Samford President Andrew Westmoreland shared insight from the parable of the sower, the first of the New Testament parables that will form the theme for the semester’s regular convocation series. 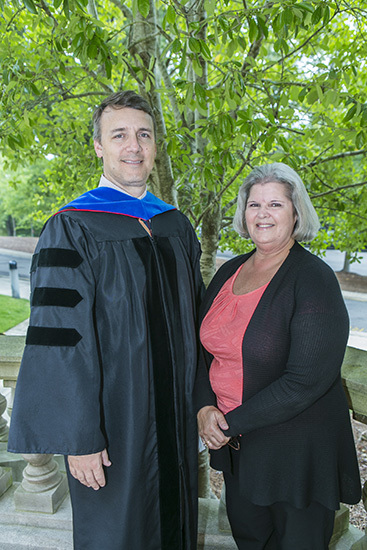 Petrella, associate professor of kinesiology in the School of Health Professions, received the John H. Buchanan Award for excellence in teaching. The winner is chosen by a vote of last spring’s senior class. Petrella was cited for his background and passion for research, which provides exceptional opportunities for his students. For three consecutive years, his undergraduate students have won prestigious research awards at the Southeast American College of Sports Medicine annual meeting. “While his accomplishments are impressive, it is his heart for serving others that outshines all other accolades,” said Samford provost Michael Hardin in a video presentation. “He is sought after as a mentor by students and faculty for his wisdom and advice, and because they know he cares about them, their success and most importantly, about what God is calling them to be,” Hardin said. Petrella holds a bachelor’s degree from Georgia Institute of Technology and master’s and Ph.D. degrees from the University of Georgia. He joined the Samford faculty in 2007 and in 2010 became a Fellow of the American College of Sports Medicine. Martin, administrative assistant to the dean in the Howard College of Arts and Sciences, received the Bill Nunnelley Award in recognition of outstanding job performance by a staff member. She was cited for her invaluable service in all phases of administration, including budgeting and planning, student registration, facilities planning and maintenance, supervision of support staff, alumni relations and more. Considered a university resource who is often consulted by other units, she serves on the Staff Advisory Council and is known for offering creative solutions to difficult problems. “She is a person of great humility, with a reputation for honesty, fairness and persistence,” Westmoreland said of Martin, who is in her 31st year as a Samford employee. Martin’s award, formerly called the President’s Award for Staff Excellence, was renamed this year by vote of the Board of Trustees to honor longtime Samford public relations director Bill Nunnelley, a Samford alumnus and 50-year employee of the school. In addition to Martin, other nominees for the award were Debbie Crowson, Student Records; Yolanda Long, Brock School of Business; Elizabeth Primm, Office of Admission; Ruth Holt, Orlean Bullard Beeson School of Education; and Brad Radice, Office of Marketing and Communication. Special recognitions also went to several hundred students who hold positions of leadership and many faithful donors who have supported the university with a financial commitment for at least 35 years. Many of these Samford Founders Circle members have given to the university for 40 years or more. Westmoreland based his remarks on the parable from Matthew chapter 13, in which some seeds fell by the way side, some fell upon stony places or among thorns, and others fell to good ground and brought forth fruit. In the “beautifully simple” passage, Westmoreland said, Jesus succinctly offers four conditions of life: three that can lead to problems and one that can lead to fulfillment. “We each have the capacity to have all four,” he said. To acknowledge two “exemplars” of the fourth condition, Westmoreland called on Samford suitemates Ashley Lyon and Margie Terp to share their story of hearing a need, understanding and doing. Lyon told how her teenage brother, Jason, was diagnosed in June with an inoperable brain mass. He has begun his senior year in high school in California, she said, but is still very sick and undergoing cancer treatments. “The Lord is good, and we know He will be faithful. Jason is blessed,” she said. As encouragement to Jason and his family, Terp developed an idea for Samford people to make a video showing their love, support and faith. Images of students, administrators and other Samford friends bearing signs of “Lyonhearted” support were captured at sites ranging from the campus to Australia. View Jason’s inspiring story and the video here.